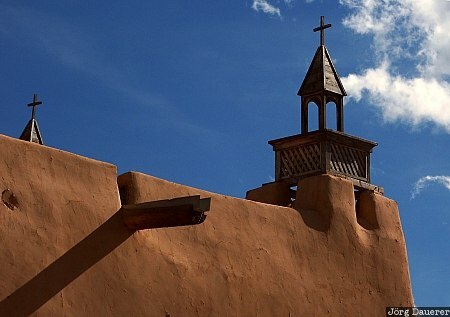 The adobe church San Jose de Gracia in Las Trampas below a deep blue sky with some white clouds. Trampas is on the high road between Santa Fe and Taos in northern New Mexico in the south west of the United States. This photo was taken on a sunny day in February 2004. This photo was taken with a digital camera.